Carol Caffin was Rick Danko's publicist in the '90s. She has written Rick's bio at this web site, and is currently working on BandBites, a series of The Band-related interviews. Copyright © 2007 by Carol Caffin. All Rights Reserved. Terry Danko was born in Greens Corners, near Simcoe, Ontario, in 1949. The youngest of four brothers, including The Band's Rick Danko, Terry was born into a musical family and has been performing, recording, and writing songs for most of his life. Encouraged by the music that surrounded him, both at home at family get-togethers in which "everybody sang or played an instrument," and in the close-knit, familial community of Simcoe, Terry began performing as a child and had a local radio show by the age of 12, when he also began playing regularly in nearby Turkey Point on Lake Erie. Though a natural performer and musician, Terry's first love has always been songwriting and, in 1967, together with guitarist and fellow songwriter Jim Atkinson, Terry formed the group Tin Pan Alley, whose name was taken from the "mythical songwriting place" of the same name. "We were doing all original songs, which was something that wasn't being done at that time in Brantford," Terry recalls. It was that year at a Brantford venue called the Graham Bell, where Tin Pan Alley was playing to full houses and drawing a university crowd, that Ronnie Hawkins, who'd recruited Terry's brother Rick for his band, The Hawks, seven years earlier, spotted Terry and his band and homed in on them as well. Lured by Hawkins' built-in audience and the promise of being able to play their own songs, Terry and Jim joined Ronnie Hawkins and The Hawks. "It worked out great for a while," says Terry. "We got with Ronnie and helped put him back on top in Toronto. We played the Nickelodeon on Yonge Street and were just packing the place there." After less than two grueling years of non-stop, rigorous playing -- and with little time or energy left to write songs -- Terry began to feel creatively stifled, and left Hawkins. Together with Atkinson and keyboardist Dwayne Ford, he formed Atkinson, Danko and Ford and, in 1972, signed with Columbia Records, which released the group's eponymous debut album and the single "Right On." In 1973, the group changed its name to Bearfoot and released the album Friends with Bearfoot. In the mid 70s, Terry moved to California, where he continued to write, perform, and record, and became a sought-after session musician, working with everyone from Eric Clapton to George Harrison to Steven Stills to the Rolling Stones. He played on Clapton's star-studded No Reason to Cry in 1976, on his brother Rick's acclaimed self-titled debut album in 1977, and on numerous other releases in the ensuing years. 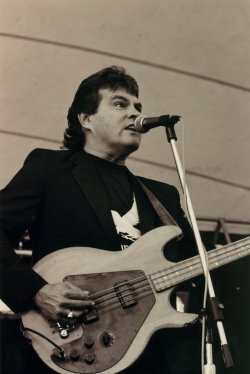 He toured with Rick in 1978 and, in 1983, he rejoined Ronnie Hawkins, with whom he toured and performed for several years. After a self-imposed, multi-year hiatus from the music business, Terry began writing again in 2006. Since then, he has amassed a collection of 50 new songs -- many of which are the best of his career -- just waiting to be heard. "Writing songs is still what I want to do," he says, "and I am eager to play them for people, too." Copyright © 2007 Carol Caffin. All Rights Reserved.